The Coordinator of Environmental Protection and natural resources, Centre for Sustainable Development, University of Ibadan, Dr. Jimoh Saka has urged Nigerians embark or right tree planting and do away with waste of financial and time resources by avoiding planting during ember months specifically anytime from September. Dr Saka however enjoined Nigerians to start planting trees in order to ameliorate the impending effects of climate change in the country. The Forest Management expert who lectures in the department of Social and Environmental Forestry, University of Ibadan gave the advice while speaking with journalists shortly after he delivered a lecture at a program organise to sensitise Nigerians on the dangers of the climate change entitled "Rise for climate event" which was held in Ibadan on Saturday. The don while warning against what he called "political tree planting" among federal, state and corporate organisations said "it is a waste of money, time and resources to see that government officials, federal and states, individuals, corporate organisations and institutions in Nigeria embark on tree planting in September and October when the rain season is almost over". Saka while charging youths to embrace tree planting with a focus to reduce the effects of climate change in the nearest future, added that "tree planting that is common in September among Nigerians can only he described as "political tree planting", because "they will budget another money for tree planting the following year, they don't know the appropriate time to plant trees". He said, "The youth, let us engage in massive tree planting because you are the owner of the future. Those who are above 50 years today, in the next 30 years, they will be all gone. So if you plant trees now, the future will be good for you, but of you did not, there will be serious calamities. In order to avoid calamities, all hands must be on the deck". "What I mean by political tree planting is when you plant trees, you make noise on television and radio, you announce that we want to plant trees, it is good to plant trees, it is good to create awareness but is the process right? It is a waste of money when you plant trees in September or October. "Like I said, tree planting in Nigeria, the best time to do it is between May and July because this is the period when rain stabilises, so you plant your trees during rain season. You don't have to wet it with water again because by October or November, when the rain will stop the tree is already stable. You don't need to wet the trees again. "But, if you delay it till September or October, that is common in Nigeria when government plant trees in September, it will have one month of rain, during dry season, you start to wet it, then the tree will die. So, you budget another money for tree planting the next year. This is political tree planting. "Trees are known to ameliorate the impact of climate change. They help to mitigate the effect of climate change. Trees are known to absorb. A tree may lock up carbon dioxide in its system in its lifetime if it is not fell. So, trees play significant role in climate change amelioration. They also play a role in micro climatic amelioration. That is why you will see people in hot climate, they will go and sit under a tree that is cooler than outside. That is what we called micro climate. The small climate in our environment". 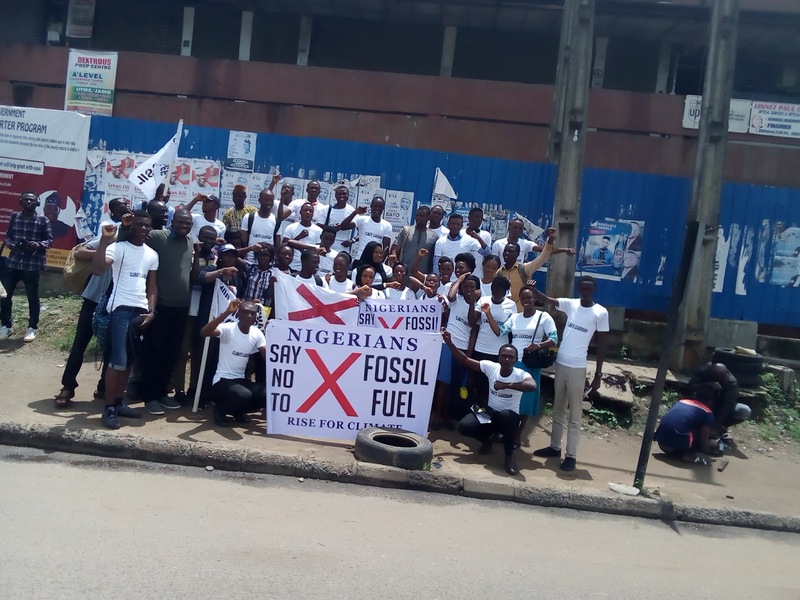 The organiser of the event, Mr. Tosin Afeniforo while speaking with our correspondent described the event as a global event aimed to reduce the effects of climate among the people. Afeniforo said, "Rise for climate event is a global event that is happening in many countries at the same time. 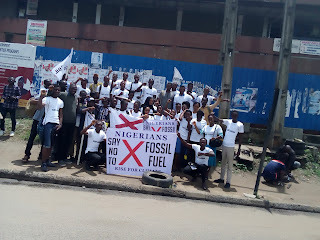 This program is all about rising of climate and the message we are passing is that our leaders and people should desist from all acts that lead to formation of climate change. "Another message is that our leaders should switch to renewable energy. They should switch over to renewable energy. We should desist from all acts that lead to climate change.